Pulstar makes four models of what are known as straight pull hubs. They are straight pull because these have don't have flanges in the conventional sense. Common flanges require the spoke to pass through the hub perpendicular to the line of bike travel. The spoke must then turn at 90 degrees to reach the rim. This bend at the spoke head to permit the spoke to reach the rim is well known as the spokes chief weakness. As the hub rocks slightly from side to side with each turn or pedal stroke, the hub flange wears away the supporting area around the head leading it to ultimately snap off. Spoke head failure is far less likely to occur with these hubs. At each end of the hub shell there are a certain number of points, (11mm wide) which the spokes anchor in. The number varies with the spoke count, there are seven points on each side carrying two spokes on the 28 hole hub. There are eight points with two holes each at each end of the 32 hole hub. Each hole is countersunk, one in each direction. The spoke passes through in a straight line toward the rim. The spoke in the hole next to it passes in the opposite direction straight to the rim. The spokes behave as through they are radially laced, that is straight to the rim with no crosses, but Pulstar hubs are intended to built with crossed spokes. Naturally using these hubs means that you have to use matching straight pull spokes. There is a couple of sources for Titanium wire straight pull spokes. Please look in our spoke section for more on straight pull spokes. Besides four models of hub, Pulstar makes them in up to six colors with two hole drillings. Look, here's the dilemma, when you try, in the bike industry, to establish a new standard, the only way that it will ever be widely accepted is if you can get the large bike factories in Taiwan, China, (and where ever the industry thinks the next least expensive labor pool is likely) to use your idea on the production bikes ordered by all the big names, Scott USA (only it really isn't as USA as you would think), Schwinn (really Scott USA under another banner), Raleigh, Trek, Specialized, GT, Bianchi, and all the other names used on bikes. In order to get your new standard on bikes made in the orient, you either ship the American made version to them, or more likely, you have a Taiwan maker, for less money, manufacture the parts you want installed on bikes. In this way, they are in-expensive, and locally available for the bike factories. This is a big part of the OnZa and Ritchey success, and Aheadsets really succeeded only once there was Asian production. Now, if you get an Asian factory to build a copy of your part for less money, in volume, even though the quality isn't exactly what you really want, but it appears good enough to get away with (to everyone except the really knowledgeable), how long do think it will take before the American manufacturer starts selling only the Taiwan copy at a higher profit without letting anyone know? More often than you think, in fact, it happens all the time. For Pulstar hubs to really be adopted they will have to be specified on factory built bikes, not just aftermarket replacements. Many times to get around the aura of this "made in the orient to price" perception companies will use "USA" in their name. Keep this in mind as you read through these reviews and consider it more broadly in your reading of bike parts. 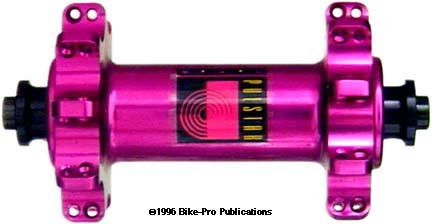 After Pulstar trashed its name selling the Taiwan import as "Us Quality" with replacements of the freehub mechanism being unavailable, they tried to introduce a "9000 Series" hub. No one has bought into it and Pulstar is dying the writhing death the self-induced. 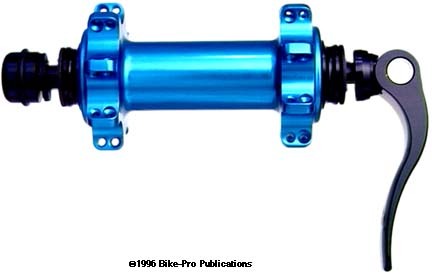 The Pulstar standard front hub, is relatively simple in design. The shell is one piece, CNC machined from 6061 T-6 billet aluminum. The hub shell is drilled through and bored from each end to make a seat and recess the bearings. Two NMB 629D precision sealed bearing cartridges, from Singapore, are used for bearings. One bearing is pressed into the hub then an aluminum tube is inserted into the shell. The tube has an inner diameter slightly larger than the axle's outer diameter. The axle is made from Cro-moly steel.